Hello, friends! If I'm not going to post very often, then I guess I'll at least stick to interesting stuff-- like race reports! On June 4, I competed at the Ironman Victoria 70.3 on beautiful Vancouver Island. Bear with me as we explore the highs and lows of that gorgeous and challenging experience. Last fall, in the midst of my three month long sabbatical from training, I signed up for a half ironman. While the timing wasn't great (for signing up for a race nor for being prepared to race so early in my usual tri season), the venue was perfect. Victoria is a pretty short trip from Seattle, where my grandma and cousins live, so I would be able to combine my race-cation with a nice visit with family! Even better, my sister decided that she would come up for the race - a first since I started tri-ing 4 years ago. Mom, grandma, and sister's partner also decided to come play support crew! It was so special to have them all there and it definitely made it worth travelling out to BC to race. The GORGEOUS course!! Man, it was stunning. From views of the water, to sections where we seemed to ride in the middle of old growth forest, to a picturesque lake swim and cottonwood dusted fairy-land run course... it was all so pretty. The smell of the sea that caught my nose as I finally found a section on the bike course to put pedal to the metal around the 60-65k mark. Flying downhill after the turnaround at 72.5k. A sweet reward after a very steep climb. Hearing (though not always seeing) my family cheering for me at various points throughout the day! Okay, with those to form the basis (and hopefully soften some of the rest of the report), here we go! I flew out to Seattle on Thursday morning. The plan was to meet Grandma and Mom in Seattle, and for Taryn and her partner to also meet us there, so we could all head to Victoria together on Friday. Mom and I went to the Métier Cycling shop to have my bike re-assembled. There were some dicey moments where the piece to hold my seat post in place had fallen into the bike frame and we were unsure if it would come out... but in the end, the bike was back in one piece and ready to ride. Then, we had a great family dinner with my cousins Thursday night. Friday, we took a magical ferry ride from Tsawwassen to Victoria. I was reminded of how much I love and miss the water! We arrived and went to our VRBO, a lovely house in an neighbourhood full of beautiful old homes in Victoria. Then we went over to the race site for packet pick-up, followed up by Pizza at Lido's on the Waterfront (delicious food and a gorgeous view). Saturday, we had a yummy breakfast and then drove the bike course. It took us forever (nearly 2 hours 40 minutes including a bathroom break) to drive the course. Phew! 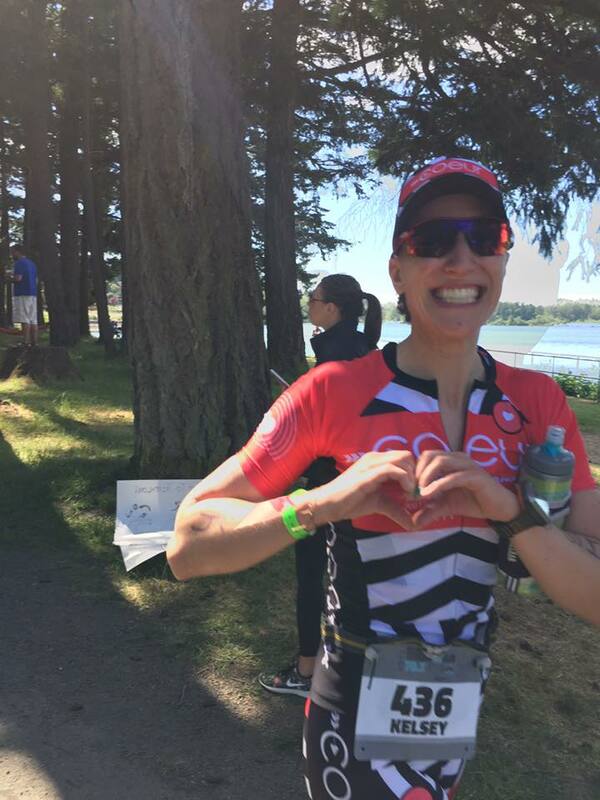 After the drive, we went back to Elk Lake so I could rack my bike and meet Coeur teammate, Heidi for a swim. I made the mistake of racking my bike and thinking I could go back in to get it for a quick spin-out ride, but I wasn't allowed to take my bike out which meant I had to trust that everything was fine (I checked the gears, but not the brakes - yikes). Heidi and I had a great swim. The water temperature was perfect! After the swim, I took a quick jog on part of the run course. I was in awe of how pretty it was. Then we went home to make dinner - grilled salmon and chicken, sweet potato, beets, and fresh tomatoes. I prepared my race gear and got to bed by about 9:30 pm (a little later than I was hoping). On Sunday morning, I woke up at 3:30 to eat my overnight oats and drink some coffee. Then mom and I piled into the car to go to meet the shuttle buses. It definitely felt like a tight squeeze timewise, as we didn't really get to the transition zone until almost 5:30!! Luckily mom held a spot for me in the port-a-pottie lines while I dropped off my stuff in the T-zone. 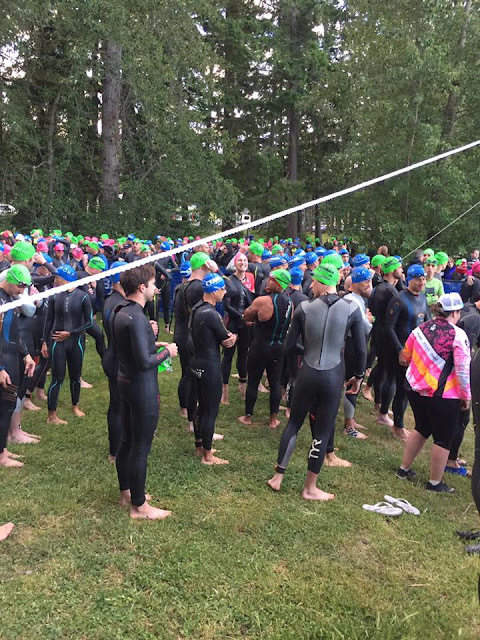 By the time I made it to the swim start, the pro-men were just going off to start their race (technically 6 minutes to my race time and I didn't even have my wetsuit all the way on!). The swim was pretty intense! It was my first time doing a self-seeded start and I was really excited to swim with the fast fishies for once. There were a small handful of pink caps (and women in their blue AWA caps) up at the front and I was happy / proud to be one of them among a big crowd of men. 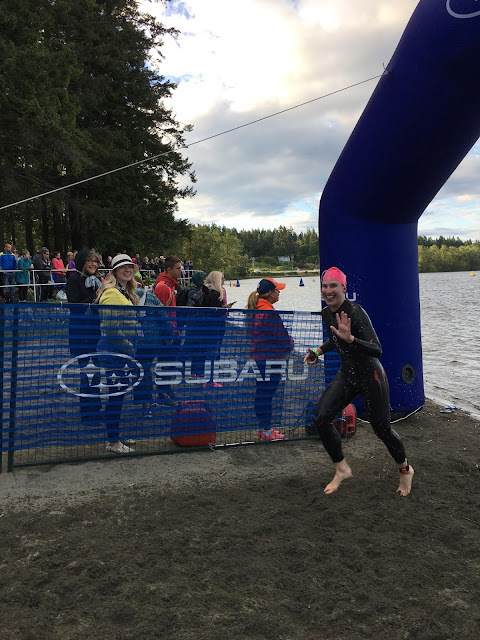 I had been one of the last people to wriggle into my wetsuit, so I was also happy when we had 2 minutes added to our start time to give the pro-women a bit more clear water. Since our chips would go off as soon as we passed under the start arch, we filed mostly single file through a narrow opening in the fence once the starting cannon went off. The whole way out was a blur of thrashing arms and legs. It was definitely the most intense open water swimming that I've been part of, as we all jostled for position and tried to either catch a draft or lose those drafting off of us. It didn't necessarily feel like I was swimming that hard, but I definitely felt like it was taking a lot of energy. As I turned at the last buoy to cross over to head back to shore, things started to settle a bit, and I tried to pick up my pace a little. Despite very minimal swim training over the course of the winter and spring, I felt pretty strong and like I was catching the water well. Though I had no idea at the time, I'm very happy with a sub-30 minute swim. As I exited the swim, I saw my friend Betty! She caught some great photos. Betty used to live in Ottawa, but has relocated to Victoria. T1 was uneventful. It felt pretty smooth, though I wish I had taken the extra seconds to strap my watch on rather than fiddling with it for the first couple hundred meters on the bike. At the very beginning of the bike, Coeur teammate Liz flew by me! I knew she'd be coming since I had heard her name announced when I was in T1. We exchanged a quick hello and she was off like a rocket! The bike was a challenge. When we drove the course the day before, it took us so long, so I should have known to expect a slow go of it. With some wicked wind (head wind? cross wind? who knows?) and lots of jockeying during the first 20-30k as people streamed onto the course, the first half was tough. There was a no-passing zone too, which was kind of a nice reprieve for the legs, but we got stuck behind a poor girl who probably didn't need a bunch of people essentially drafting off of her. Two men broke the rules and passed anyways, setting off a bunch of yelling from the rest of us. (Also realize we shouldn't have been drafting, but man it was nearly impossible to stay far enough back! I also found there is a lot of drafting that gets overlooked and it was clear to me who was benefiting from drafting and who was riding off their own merits. Sometimes being a rule follower is frustrating!). Anyways, most of the ride felt challenging, even on the way back when we maybe had some tail wind. I just felt like I could never settle into a pace, that I was constantly turning or finding myself at another short and sharp hill. I definitely hadn't really understood or prepared for the course properly (lack of endurance and lack of hills definitely was hard to hide from). Overall though, as I said before, the course was stunning and I often caught myself in awe of how beautiful it was and how grateful I was to even be out there riding my bike. When I found myself in a mentally dark place, I reminded myself of those very things - it's pretty here and I'm pretty lucky to be riding. Gear: Argon 18 E-117 Tri+, Bontrager Ballista helmet, Pearl Izumi Tri Fly V; Fuel: 3 bottles water, 1 bottle concentrated NBS Nutrition Hydration in Pineapple (yum!! ), lots of cocoa date nut balls. Off the bike and onto the run. Another uneventful transition, which is exactly the kind that I like! So for two years, I've been biking in shoes that are just the slightest bit too small. I had fully intended to find new bike shoes before this race, but I was unsuccessful. Which meant that my toes were numb, from a combination of cold and the tight bike shoes, for the first 8k of the run! Not ideal by any stretch and definitely not ideal when it is a trail run... bringing me to say that I also wish I had worn my trail shoes instead of my regular running shoes (which are essentially racing flats). I even packed my trail shoes, and contemplated wearing them, but in the end did not. Gear: New Balance 1500 v3s; Fuel: 1 Salted Chocolate Gu, 1 Cherry Lime Gu, 1 bottle NBS Nutrition Hydration in Pineapple, and water at almost every aid station (1 cup to drink, 1 cup over the head to stay cool). 1-6k - Wow, I actually feel pretty good, and my pace is pretty close to target, but man, I have to pee! Peeing on myself when running on a dirt trail doesn't actually sound appealing, better find a port-a-pottie. At 6k water station - pee break! Sweet relief! 6-8k - Totally lost my legs and now we have a hill to climb, yuck! 8k to 10k - This feels brutal, though the gel seemed to help a bit. Begged some kids for some cheers and encouragement. At the start of the second lap - super thankful for all the spectators and get a surge of energy, though it does not really translate to a surge in pace. 10k to 17k - Okay, this isn't horrible, but I just can't get my legs going any faster! 17k - On the second time coming back down the hill, witness a woman face plant. Stop to help her, but she claims to be fine despite gravel hanging onto her lips (ouch!) and blood all over! At that stage, I stopped to help for 2 reasons - 1) I genuinely wanted to help! and 2) I had sort of given up on my own race, so didn't care at all about losing time to help someone in need. 20-21k - so freaking happy to be almost done!!!! Crossing the finish line was pretty sweet, though admittedly I was disappointed in my overall time. I had gone into the race convinced that I could have a better run time, but in the end it was slower than at Timberman. In the end though, I still enjoy the 70.3 distance. I got to race on a truly beautiful course. 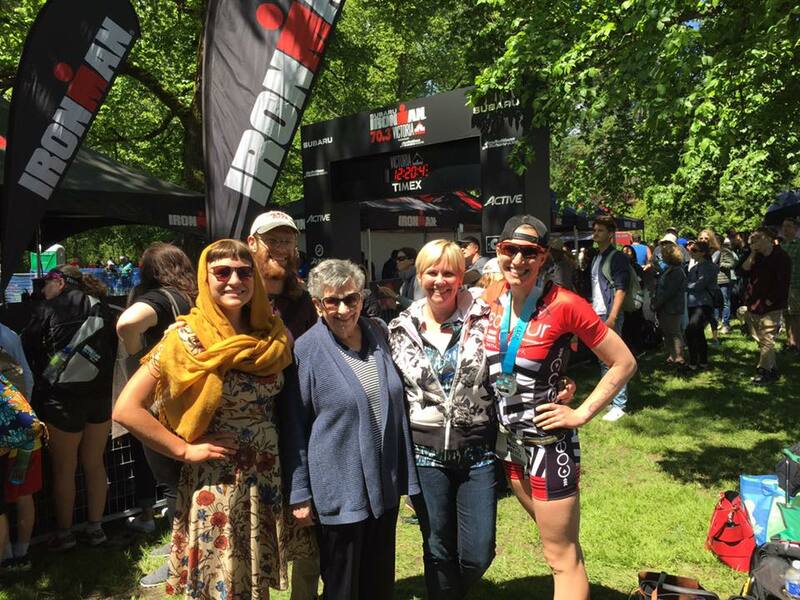 My family was there to support me and I can't thank them enough for coming to the race! And I got to meet three more Coeur teammates - Heidi, Liz, and Christine. My Coeur Sports team kit makes me feel like a rockstar and Pistol Annie is still a dream bike (even though I definitely need that bike fit I have scheduled for next week). All in all, it was good! Great report!! I still need to write mine!! I did this race in 2015 before they changed the bike course. I think that it is harder now. Like you, I didn't train on a ton of hills because the weather was so crappy this winter! The run seemed harder this time around too! Maybe I am just getting older! :) I wish we would have gotten to meet! Hope you have a great summer! You seem to enjoy all this.LOL. I am so looking forward to train my daughter to follow yoru footsteps.I would appreciate your help in this regard as well.